The more films I watch, the harder it is to find something truly unique, moving and original. Out of the 200+ films I saw and wrote about in 2016, twelve received an A/A-, standing out enough to make my ‘best of list’. I have narrowed it down to the most important ten. My list doesn’t cater to what awards the films might win, many of them don’t match the mainstream selections or even those of other critics. They are the films that touched me beyond just a two-hour distraction. In fact, entertainment value is probably the least important quality when I am grading a film. I like to walk out of the cinema changed, enlightened or moved, better when it’s all three. 2016 was a year in film where no one really pushed the barrier of what’s possible. The art of movies didn’t leap forward with technology like years past, nor did it have one single movie that everyone rallied behind universally. 2016 was a year where smaller films, even middle-ground films, struggled to get any attention while franchises, sequels and reboots dominated most screens. Before the fall season arrived, 2016 was bleak and full of despair, no real worthy films in sight as studios like Marvel, Disney and others plague screens with recycled stories and characters. While profit is certainly important for the movie industry to sustain itself, for those of us watching all live action feature films, it’s mostly a garbage disposal of time wasters. 80% or more of movies released in America have no historical staying power, audiences watch them, and forget them the next day. Even some critics forget what they saw last week. I gravitate towards films that I want to bring into my home, my collection, share with friends. A timeless quality, a repeat factor, are essential for the films I select each year to represent the best of what I saw. People, places and subjects that rarely get the focal point of plot lines are what interests me the most. I am a not a fan of a galaxy far away, but of the human condition and experience in this life. I don’t gravitate toward battle scenes, rather an internal struggle between people and emotion. Computer animated figures will never capture my attention the way an actor playing a real person can. Lion (#1) didn’t start out as my favorite film of 2016, it slowly grew into that position. I first saw the India/Australian production at the Austin Film Festival in October. I was moved to tears during that screening and the performances from Dev Patel, newcomer Sunny Pawar and especially Nicole Kidman. It instantly landed on my best list, but it wasn’t until after I re-watched all my top movies that I fully understood the impact of this story. It’s an extraordinary feature film debut from Garth Davis that touches an emotional chord no other film manages this year. It isn’t just a true story about a boy trying to find his family, but one about finding your place in this world and understanding the beauty around you. It also shines a bright light on adoption and parents who choose adoption. Hell or High Water (#2) remained my top film for the majority of the year. It isn’t an emotional ride, but a satisfying thrill ride that goes bone deep with its understanding of West Texas. Jeff Bridges might not be doing something we haven’t seen him do before, but he is doing is so well here, he is embedded in the territory, the voice and the look. He is Texas. Chris Pine turns in the best performance of his career, Ben Foster nearly steals the show with his unpredictable approach. But the real star is Texas itself and writer Taylor Sheridan who brings allows the minor Texan actors into the forefront of this story that isn’t just about a bank robbery, but modern society taking hold on the last bit of true west in America. Jackie (#3) is one of the year’s most surprising films. Yes, it’s a movie about former First Lady Jaqueline Kennedy, but Argentinean filmmaker Pablo Larraín refuses to present you with a procedural biopic. Instead, he delivers a visceral, near horror life, art film that’s as disturbing a portrait on someone we thought we knew, as it is an enlightening one. Jackie could have just been an acting vehicle for Natalie Portman, who gives the performance of the year, but Larraín brings you back and into the dangerous times of November 22nd 1963. It’s a masterclass in acting, set design, editing, and the musical score is so outside the normal, composer Mica Levi deserves credit for changing the way we think of music in a film. Arrival (#4) like other films on my list isn’t confined to the genre it exists in. It’s not a thriller like Gravity, it’s not space travel like Intersteller, it’s a small, quiet film with a big emotional impact if you work for it. It’s a puzzle piece, that requires your most dedicated attention span. 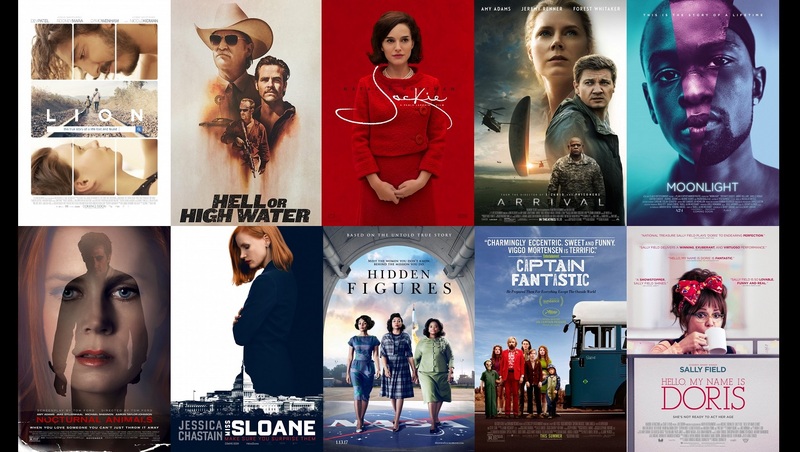 Amy Adams appears in two of my top ten films, although her presence or performance is smaller than the whole concept. The look of the film is extraordinary and director Denis Villeneuve again offers us a film with a woman at the forefront. But what makes Arrival so important, is the question it asks the viewer, the self- reflection it offers. Moonlight (#5) is arguable one of the most important films of the year. A true ensemble acting effort that captures the pain and misunderstanding of life through the eyes of one young man at different stages in his life. Writer/director Barry Jenkins puts us behind the eyes of a scared little boy, a bullied teenager and a misunderstood young man as three different actors capture the essence of Chiron. It’s the kind of film that affects you emotionally, physically and internally, lasting for days after you see it. Nocturnal Animals (#6) is an exercise in style as writer/director Tom Ford explores the noir genre. It’s a film that asks the viewer a lot of questions and doesn’t offer many answers. It takes things of beauty and turns them nasty and cruel, offering actors Amy Adams, Jake Gyllenhaal, Aaron Taylor Johnson and Michael Shannon parts they wouldn’t usually play. Also set in West Texas, Ford says a lot with each carefully executed image, the often overpowering original score is devastating and perfect. Miss Sloane (#7) sets out to prove a woman can be as powerful, devious and manipulative as any man. Of course we already know this, but Jessica Chastain’s performance personifies that in an electric way that carries the entire movie. The character toys with the audience, do we like this woman or hate her, and that’s what makes it so great, it’s not just one thing or another. The movie has a lot to say about lobbying, gun control and the government. It’s a faced paced political thriller that might require two viewings to get the full impact. Regardless, has the most satisfying ending of any movie this year. Hidden Figures (#8) is another powerful true story, told through film can equally entertain and educate. It shines a light on the black women of the 60’s work worked as computers at NASA. The screenplay turns three real women into mathematical heroes as they struggle to be treated like their coworkers. Taraji P. Henson, Octavia Spencer and Janelle Monae have you laughing one moment, wiping your eyes the next. It’s a crowd pleaser from start to finish. Captain Fantastic (#9) is the odd little summer indie that really gave me hope between all those special effects films. Viggo Mortensen gives one of his most passionate performances in a film that looks at family a little bit different. It presents ideas and concepts that are unusual as one wilderness family struggles with the ideals of the modern world. It’s as creative a story as the characters are colorful, never allowing itself to fall into the predictable or expected. Hello My Name is Doris (#10) might be an odd choice here, but it’s a film I fell in love with at SXSW in 2015. It was held for a year and released this past spring. Sally Field is the heartbeat of the movie that centers around a 70-year-old woman who is coming of age for the first time. It’s the funniest movie of the year, but also filled with inspiration that we are never too old to act out and rediscover ourselves. I’m intrigued! I want to see all of them!! !